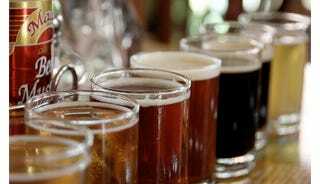 An alcoholic drink made from yeast-fermented malt flavored with hops: a pint of beer | I’m dying for a beer. beer and skittles [ often with negative ] Brit. amusement or enjoyment: life isn’t all beer and skittles. ORIGIN: Old English bēor, based on monastic Latin biber ‘a drink,’ from Latin bibere ‘to drink’; related to Dutch bier and German Bier . A movable frame on which a coffin or a corpse is placed before burial or cremation or on which it is carried to the grave. ORIGIN: Old English bēr, of Germanic origin; related to German Bahre, also to bear.